Amos 5:22-25, You shall love the alien as yourself. Psalm 7 I thank God for his Justice. Luke 11:37-44, Give for alms those things that are within. Christians can sometimes be very committed to prayer and worship, but less concerned for the poor and the marginalized. Sometimes we pray in church, but at the same time oppress our fellow human beings or exploit the environment. Christians in Indonesia recognize that in their land there are people who passionately try to practice their faith, but who oppress those of other beliefs, even using violence in doing so. But in the Gospel of Luke, Jesus reminds us that the outward sign of true worship of God is acting justly. He is fierce in his condemnation of those who neglect this obligation. In the prophecy of Amos, God rejects the worship offered by those who neglect justice, until they “let justice roll down like waters, and righteousness like an ever-flowing stream.” (Amos 5:24) The prophet insists on the absolute link between worship and doing deeds of justice. When Christians work together to listen to the cry of the poor and the oppressed, they grow in communion with one another and with the Triune God. God of the widow, the orphan and the stranger, You have shown us the path of justice. Help us to follow your way by doing justice as our worship of you. As Christians together, may we worship you not only with our hearts and minds, but also by our deeds. May the Holy Spirit help and guide us to work for justice wherever we are, so that many people may be strengthened through our works. We pray in the name of Jesus. Amen. Ephesians 4:22-25, Let all of us speak the truth to our neighbors. Psalm 119, Your righteousness is an everlasting righteousness. Violence towards fellow humans is not found only in physical assault and robbery, but also in gossip and malicious rumors. Social media have made it easy for untruths to be circulated instantly to a wide audience. Christians in Indonesia are aware of how this has sometimes led to lies and prejudice being propagated by religious groups, including Christians, against other religious groups. Fear and the threat of reprisals can make people reluctant to stand up for the truth and can cause them to remain silent in the face of unjust and untrue statements aimed at causing fear. Jesus boldly said, “Let your word be ‘Yes, Yes’ or ‘No, No;’ anything more than this comes from the evil one.” Deceitfulness destroys good relationships between persons and between groups, including churches. Dishonesty disrupts the unity of the church. The Letter to the Ephesians reminds us that we are members of one another. This is a call for Christians to be honest and accountable to each other, so that they may grow in fellowship. When we do so, it is not the spirit of the evil one, but the Holy Spirit of God who will be with us. God of righteousness, grant us wisdom to distinguish right from wrong. Let our hearts be guided by honesty and our lips speak the truth. Give us courage to be truthful even when others go against us. Keep us from spreading deceit; make us, rather, agents of unity and peace, spreading good news for all people. We pray in the name of your Son, Jesus Christ. Amen. Psalm 145, The Lord is gracious and merciful. Matthew 1:1-17, The genealogy of Jesus the Messiah. “The Lord is good to all, and his compassion is over all that he has made,” said the psalmist, proclaiming that the love of God is beyond boundaries of ethnicity, culture, race, and even religion. The account of the genealogy of Jesus in Matthew’s gospel reflects this expansive vision. While ancient cultures often saw women as inferior, or as the property of their fathers or husbands, Matthew names four women among the ancestors of Jesus, two of whom, Ruth and Rahab, were Gentiles. Three other ancestors in the list were known for their sinfulness, including the adulterous King David. Naming these in the genealogy of Jesus and making them part of God’s human history, proclaims that God includes everyone, male and female, sinner and righteous, in his plan of salvation, regardless of their backgrounds. Indonesia is a nation of over 17,000 islands and 1,340 different ethnic groups, and churches are often separated along ethnic lines. Such exclusivity can lead some to see themselves as the sole possessors of the truth, thus wounding the unity of the church. Amidst escalating ethnic and religious fanaticism and a growing spirit of intolerance throughout the world today, Christians can serve the human family by joining together to bear witness to the all-embracing love of God, proclaiming with the psalmist that “the Lord is gracious and merciful” to all. Hebrews 13:1-5, Be content with what you have. Psalm 103:6, The Lord works vindication and justice for all who are oppressed. Matthew 6:25-34, Do not worry about tomorrow. The writer of the Letter to the Hebrews warns against excessive love of money and material things. In the face of our tendency to think we never have enough, the text reminds us of God’s providence and assures us that God will never forsake creation. Through the fruitfulness of earth, rivers and seas, God’s goodness has provided ample food and fresh water to sustain all living beings, and yet many people lack these basic necessities. Human weakness and greed frequently lead to corruption, injustice, poverty and hunger. It can be tempting, instead of caring about others and sharing our goods with them, to gather and accumulate money, food and natural resources for ourselves, or our own nation or ethnic group. Yet, Jesus teaches us that material things should not be our main concern. Rather, we should strive first for the Reign of God and its values, trusting that our heavenly Father will provide for us. In recent years, some churches in Indonesia have been providing various kinds of financial, human and educational support to small churches in rural areas. In this simple and practical example of mutual love they are demonstrating the unity with their fellow Christians which is God’s gift to his Church. Living more simply, not preoccupied with earning money beyond our needs or with hoarding resources for the future, can enable us to make the earth, our common home, a more just place. Compassionate God, we thank you for your bountiful gifts. Give us the grace to accept all blessings in simplicity and with humble gratitude. Enable us to be content and ready to share with others who are in need, so that all may experience unity in the love that flows from you, our Triune God, who live and reign for ever and ever. Amen. Amos 8:4-8, I will never forget any of their deeds. Psalm 89:14, Righteousness and justice are the foundation of your throne. Luke 4:16-21, The Spirit of the Lord is upon me. The prophet Amos criticized traders who practiced deceit and exploited the poor in order to gain maximum profit. Amos also underlined how God observes their wrongdoing and will never forget it. God listens to the cries of victims of injustice and never forsakes those who are exploited and treated unjustly. We live in a globalized world where marginalization, exploitation and injustice are rampant. The gap between the rich and the poor is getting wider. Economic achievement becomes a deciding factor in relationships between peoples, nations and communities. Economic issues often trigger tensions and conflicts between them. It is hard to enjoy peace when justice is absent. By virtue of our common Baptism, all Christians share in the prophetic mission of Jesus to proclaim good news to the poor and the weak, in both words and deeds. When we recognize this mission, the Spirit of the Lord will be upon us too, empowering us to work for justice. Our dignity as Christians calls us to speak and act in such a way that the words from the scroll of the prophet Isaiah which Jesus proclaimed in Nazareth are fulfilled each day in the hearing of those around us. God our Father, forgive our lust for power and free us from the temptation to oppress others. By your Holy Spirit of communion, help us to live in solidarity with our neighbor, and so share together with your Son Jesus in fulfilling your promise of freedom from poverty and oppression. We pray in His name. Amen. Jeremiah 10:12-16, He is the one who formed all things. Psalm 69, Zeal for your house has consumed me. Mark16:14-15, Go into the world and preach the gospel to every creature. Today, however, we are facing a serious global ecological crisis, which threatens the survival of the natural world. Many people have been driven by greed to exploit creation beyond its capacity. In the name of development, forests are cleared and pollution destroys land, air, rivers and seas, rendering agriculture impossible, making fresh water unobtainable and causing animals to die. In this context it is useful to remember that after his resurrection, Jesus commissioned the disciples to proclaim the good news “to the whole creation.” No part of creation is outside God’s plan to make all things new. And so conversion is needed from a tendency to exploit to an attitude that values and reconciles us with creation. Movements among people of different faiths in Indonesia and many other places are inspiring Christians to promote eco-friendly churches, and to take a stand against environmental abuses. 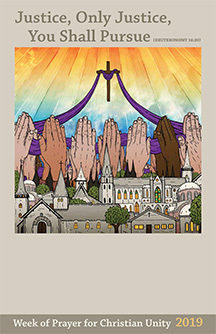 This unites Christians in bearing witness to their Creator, “for he is the one who formed all things.” When we join with other Christians in defense of our common earthly home, we are not just engaging in activism, but are fulfilling the Lord’s command to proclaim the good news of God’s healing and restoring love to all of creation. Day 7, Woman, great is your faith! 1 Samuel 1:13-17, Go in peace. Psalm 6:3, Happy are those who observe justice. Matthew 15:21-28, Let it be done for you as you wish. Eli misjudges Hannah’s deep and fervent prayer and condemns her, dismissing her supplications as drunken ramblings. Yet the words of her reply, calling on him not to dismiss her as “a worthless woman” softened his heart and he sent her away with a blessing. Likewise, when the Canaanite woman came to beg him to heal her daughter, Jesus initially dismissed her, saying that he had come only for his own people. Yet she persisted in her begging and challenging and eventually, recognizing her great faith, Jesus granted her request. In both cases, a woman who was initially marginalized and judged unworthy of attention turned out to be speaking prophetic words that softened hearts and brought healing and wholeness. The marginalization and dismissing of women’s voices continues in our own times. Indeed even within our churches we are often complicit with cultures that devalue women. As Christians become aware of their own failings in this area, they come to recognize more clearly the horror of violence against women and children, snatched forcibly from their homes and trafficked to other lands. These and many other migrant workers are often treated as less than human, and are denied the most basic human rights. In recent years churches in Indonesia have taken common action against human trafficking and the sexual abuse of children. Their efforts, and those of people of other faiths, are all the more urgent since the number of victims in some parts of their country is increasing daily. As Christians unite in prayer and study of the Scriptures, truly listening for God’s voice, they can discover that God also speaks today through the cries of the most abused in society. It is when they hear God’s call together that they are inspired to join in common action against the scourge of human trafficking and of other evils.